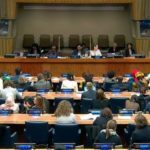 WUSME’s mission is to represent, support and protect the rights and interests of SMEs and the craft sector in the world. 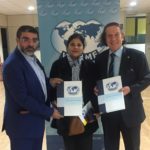 WUSME was founded in 2010, under the auspices of the Government and Public Institutions of the Republic of San Marino and the participation of Delegates coming from 53 countries. 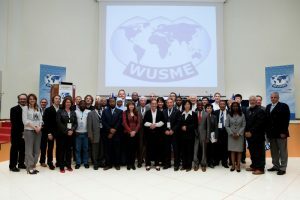 First Founders of WUSME are, indeed, a qualified group of Entrepreneurs from San Marino of UNAS, the National Craftsmen Union of San Marino, committed to create an organization to be referent point for small enterprises, a place for fruitful exchange of knowledge and experience, a tool for boosting stronger international cooperation. 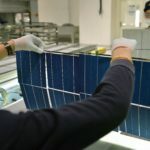 The roots of the Association in the Republic of San Marino are connected to the country’s economy, strongly based on the historical development of Crafts and Small Enterprises so overlapping with the territory. Tradition attributes to a Dalmatian Stonemason Marino the Foundation of this Republic, the oldest one in the world. 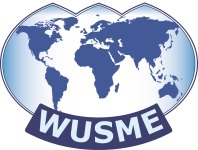 For the same reason, WUSME logo has been designed to incorporate and combine, in itself, all the elements characterizing its IDENTITY with a HEART in the REPUBLIC OF SAN MARINO and a BREATH everywhere IN THE WORLD for its strong INTERNATIONAL VOCATION: an oval with three points corresponding to the three towers of San Marino contains the whole world stands for just that.